The argument that schools have not kept up with the world’s changes is one that’s been going on for decades, but the gap is felt more distinctly in today’s world. The revolution of the internet – and all the content it brings with it – has left a key skills gap for today’s young people. That gap is media literacy. Literacy has been a key cornerstone of education since its establishment, and continues to be government’s top priorities in national curriculums – and rightly so. Key skills in literacy such as critical thinking, the ability to communicate through the written word and understanding the nuances of storytelling, enrich every person’s life. We need to learn how to communicate effectively in order to get jobs, apply to universities, work collaboratively and constructively with others, and to build positive relationships. Critical thinking allows for us to understand that every story is coming from a specific point of view, and enables us to see the truth from the fact, as well as being a useful skill to enhance our careers. However, the problem with today’s literacy classes is that they still remain focused on traditional storytelling mediums such as novels and plays. There is a certain level of snobbery still left in education where, even though these mediums have been around for a long time, movies, television and radio have been left out of the curriculum. Not only that, but now the gap is even larger as the internet has brought even more mediums into our lives. Social media platforms, online journalism, blogposts, podcasts… though similar to mediums that came before them, the creation is different. Now anyone can post anything they like, and with editing software such as the Adobe programmes or even the filters on Instagram, we are living in a world where fake news, fake images, even fake videos can be shared. These doctored images, videos and news are so lifelike, it’s hard for any of us to know what’s real and what’s not. Let alone our young people who don’t have the life experience – particularly experience of an internet-free world – that we’ve all had. It’s no wonder then that young girls are struggling with their body image in increasing numbers. Photos on social media sites like Instagram are often tagged with #nomakeup even though the people in the images are wearing makeup or have been edited so heavily that it no longer looks like a natural ‘no-makeup’ person. This is dangerous for all of us, as it sets unrealistic expectations of ourselves and alters how we encounter reality. The intelligent, critical reading skills that children learn through literacy and studying classic novels and plays just aren’t enough anymore for a world that is becoming increasingly fake. We need to teach children about the internet and its many mediums, and how these are manipulated to create a reality that is nowhere near being real. In the US, children are being prepared for a world of ‘fake news’ through programmes like The Student Reporting Labs. The labs allow children to become the journalists themselves, creating fun and engaging learning opportunities whilst educating children on what journalism is and understanding how stories can be manipulated for audiences. As children are the ones who get to create the stories themselves, children become engaged in the news and media in general, as they get to have their voices heard. ‘With our storytelling curriculum and platform, students are able to explore topics and find stories that are important to them. The audience sees stories that reflect perspectives often missing from traditional media organizations – those of young people – and that brings young people into the discussion,’ says Clapman. Media literacy in a globalized world also means that children from countries that don’t speak one of the world’s main languages, may fall behind both in their comprehension of the world’s stories and through an inability to participate on a global scale. One such language is English, which tends to dominate the world’s media as the United States has such a large global output of its own media. To make sure his students are prepared for today’s English-speaking world, Macedonia based educator Pero Sardzoski, has created a course specifically designed to help students learn how to express themselves on digital platforms when English isn’t their first language. Through strengthening students digital literacy skills, not only are Sardzoski’s students improving their communication skills in a foreign language, but charging ahead into improving their digital skills – something every classroom should incorporate, whether English is a second language or not. One of the biggest tasks with incorporating media literacy into the school day is getting it to align with school curriculums. That’s what makes NUSHU, A series of Augmented Reality adventures about international current affairs, such an intriguing idea. 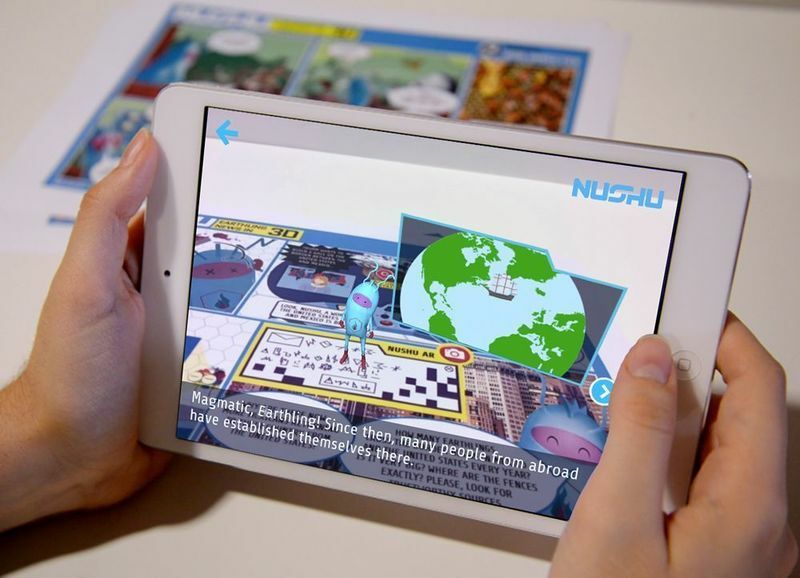 NUSHU helps children between 8 and 12 years old develop their critical thinking skills by connecting international news with the school curriculum. Through the use of 3D adventures and games children learn about some of the biggest issues of our time. When thinking about the skills children need to succeed in their future lives, we need to consider the world they inhabit. Both the monumental global issues that they need to be educated on such as climate change and what it means to live in a globalized world, but also the online worlds they come into contact with daily. Understanding how to communicate effectively online is something we all need to learn, and really it’s our duty to help kids navigate the minefield of fake news, doctored images and videos, and discovering the joys that media literacy can bring. After all, we have more opportunities than ever to share our thoughts, creations and strengths with the world via the online realm – let’s prepare children for this place with the critical thinking skills to navigate it safely and the communication skills so be able to share their thoughts, creations and views in a positive, constructive way. Find out more about PBS Student Reporting Labs, Digital Literacy for EFL students and NUSHU on their innovation pages!